Brighter, Whiter Teeth can be easy! Many things we do on a regular basis can contribute to stained teeth. For example, smoking cigarettes and drinking beverages like coffee, tea, cola and red wine can discolor the teeth. Tooth whitening (or bleaching) is a simple, non-invasive treatment used in comprehensive family dentistry to whiten and brighten the natural tooth enamel, making it an ideal way to enhance the beauty of your smile. Because having a bright, luminous smile is the number one aesthetic concern of most patients, Falmouth Dental Associates offers custom options for achieving a whiter smile. 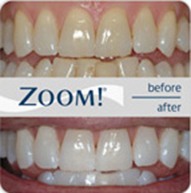 We offer an at-home tooth whitening system that will whiten teeth dramatically. This method usually requires two visits. During your first appointment, we’ll take detailed impressions (molds) of your teeth. These will be used to create customized clear plastic trays. At Falmouth Dental Associates, our dentists are experts with years of experience in tooth whitening. We will help you choose the method that is best for you and will provide after-care instructions to help you maintain your bright white smile. As always, proper oral hygiene, good eating habits and regular dental visits are recommended following your tooth-whitening procedure.